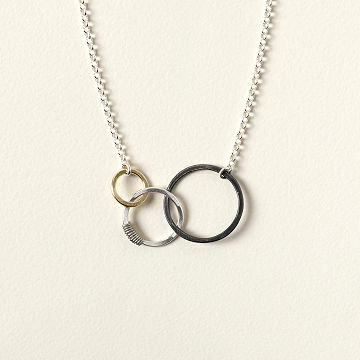 Representing the past, present, and future, this necklace offers an elegant reminder to live in the moment. We all live in a fleeting, invisible moment called "the present." Not only is now the time for us to take action, it also serves as a link between our warm, fading memories of the past, and the shining hope of the future. Jewelry artist Beth Lawrence captures this passage of time in her elegant necklace. It has three interlocking circles: a muted, oxidized ring represents the past; a sterling silver ring wrapped with a band of silver wire captures the present; and a shimmering, gold filled ring represents the future. The three are held in place by an understated, 18-inch silver chain. More than just an elegant accessory, the necklace offers a constant reminder to live in the moment. Included is a card explaining the necklace's symbolism. Handmade in Nashville, TN. Make it a set! Click here to see the matching earrings. Clean with a polishing cloth or wash with soap and water, rinse and dry well. I would have been highly embarrassed to give this as a gift. A lot smaller than the picture leads one to believe. I love this necklace. This was the 2nd time I've purchased this necklace. The 1st one's chain broke twice. I'd had it repaired and then it broke again. Not worth the $20 to repair every time so I bought a new one. It lay's well on my neck. Not too " showy "
It was perfect for our first "dating" anniversary. I wanted something that was sentimental, but not too serious, this fit the bill perfectly. I have given her jewelry in the past, but the last three times we've been together, she has been wearing this. After purchasing this gift, I realized that the jeweler is from my hometown of Nashville, so that made it doubly special. Definitely recommend! very disappointed the necklace is childlike. Looks nothing the picture. She wears it every day since Christmas.